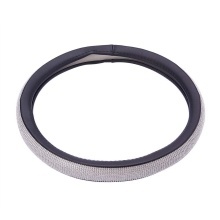 This is a kind of shinning crystal car steering wheel cover, which is made of soft leather and adorn with glitter rhinestones, fashionable design, twinkle under the light. Perfect for show your personality. You can have a try. Made of exquisite artificial Leather and hotfixed quality transparent stones. Perfect decor for your car, also protect your steering wheel. Fashionable design, bling under the light, and sparkling through windshield and shining your car. Soft hand feeling: crystal massage your palm and relieve driving fatigue, bring you a fine hand feeling. Anti fade coloring, easy installation. Classy and custom, make your car shinning. Ideal for girls, women, ladies, for yourself, your family or friend.